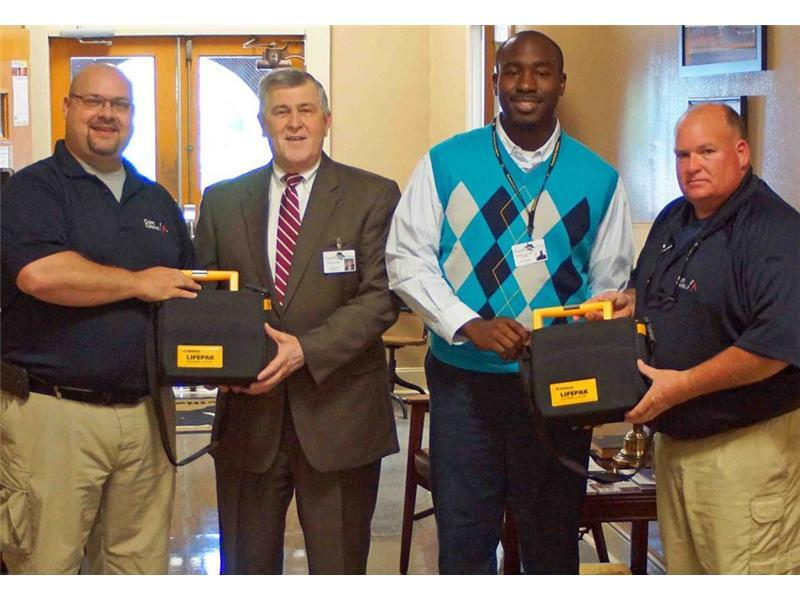 Shane Johnson and Dale Shields of the Logan County Emergency Medical Services (EMS) recently assisted the Russellville Independent School District in securing two Lifepak automatic electronic defibrillators (AED's). Defibrillators are used on student athletes or spectators with life-threatening cardiac events such as heart attacks. They work by delivering a therapeutic dose of electrical energy to the heart, depolarizing a critical mass of the heart muscle and returning the heart to a natural rhythm. These AEDs join the three already in place within the district (each gymnasium has one) and will be used at the RHS Athletic Facility and when the sports teams travel. Russellville Superintendent Leon Smith and Athletic Director Calvin Head stated that they were very appreciative of EMS's assistance in getting the defibrillators at a reduced cost, thereby saving the district several thousand dollars that can be used toward other student needs.